Links are the currency of the internet. In fact, similar to high school, link building is very much like a popularity contest. Getting in with the “right” link crowd can propel your site to great heights. In contrast, going after the wrong links can trigger unnatural link notices, Google algorithmic issues, and cause your popularity (rankings) to drop like a rock! Here at Media Wyse we don’t do cookie cutter packages. We do a detailed initial link audit, research your niche and competitors, and work to get you QUALITY links that will actually move your site competitively in the search engines. What does this mean? 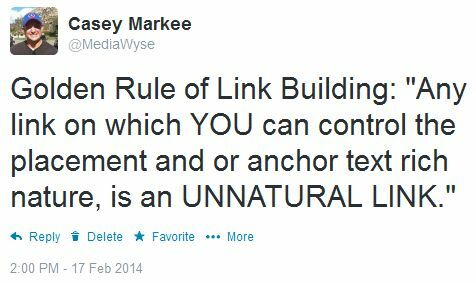 In a vast majority of situations, the above links are a COMPLETE WASTE OF TIME from a link building standpoint. If your SEO company is still pushing the above, it’s time to get a new SEO company. In contrast, here at Media Wyse embrace the concept of link earning. We are 100% Google Webmaster Guidelines compliant and are big believers that the BEST link building is by providing value to users: publishing high-quality content on your site/blog and pulling in links, social signals and traffic externally! What link building methods do we use? Glad you asked! Here at Media Wyse we don’t require long-term contracts. We do finite period Google-friendly link earning campaigns because the FASTEST way to trigger an unnatural link notice is to build in links too fast, and to hit the same anchor text and keyword phrases over and over again. See what we can do for you. Contact us today for information on our link earning campaign packages!